Inside her cramped office at the Cary Library in Houlton, Linda Faucher is surrounded by books. 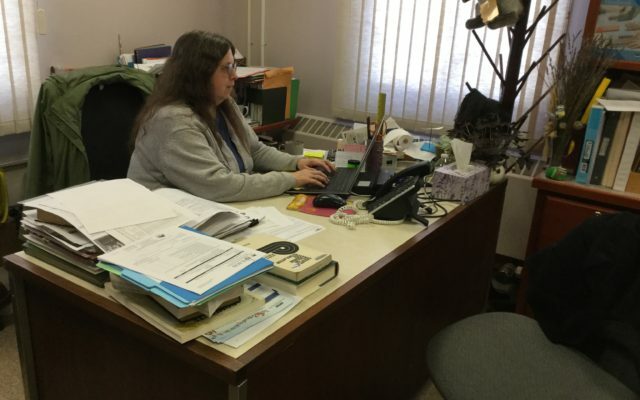 HOULTON, Maine — Inside her cramped office at the Cary Library in Houlton, Linda Faucher is surrounded by books. On a chair near the door, faded hardbacks of classical literature are mixed with paperbacks of legal thrillers, while atop her desk, self-help books are piled among literary magazines and New York Times best seller lists. Such organized clutter is an example, Faucher said Thursday, of the balancing act that it takes to both maintain and weed out the 115-year-old library’s vast collection each year. The library has more than 55,000 volumes among its shelves, including more than 800 large print titles and nearly 1,400 audio CD titles, according to its website. Faucher said she has guidelines when choosing books for the library each year, such as literary merit, locally produced or authored works, or notable books chosen by Pulitzer Prize lists. Faucher said she also turns to similar guidelines when it comes to thinning the shelves. Materials that are worn out or are no longer timely are discarded, as are those no longer considered factual. Excess copies of a title no longer in demand also are taken out of circulation. “As books are weeded out for various reasons, new material is added to the collection,” she said. Last year, she said, 3,000 items were purchased for the library, and that included books, audiobooks, DVDs and magazines. Sometimes, Faucher said, the books that are being weeded out are sold to the community, and the money benefits the library’s children’s program. While books, audiobooks and magazines remain a library staple, some things have fallen out of fashion due to the passage of time, Faucher said. The library no longer buys VHS tapes, and weeded out what remained in its collection over the past two years. Genealogy is now the fastest growing area of interest for library patrons, Faucher said, and historical books, magazines, papers and other literature related to it are preserved and never discarded.